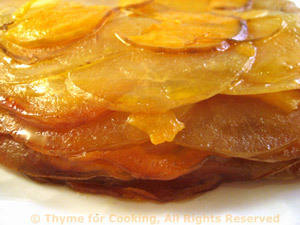 Pommes Anna, white, sweet potatoes, Thyme For Cooking variation on a classic. 'Pommes Anna' with Sweet Potatoes added... This serve 4 - 6 I didn't peel the potatoes - I like both the appearance and the taste (and it's healthier). Clarify butter: melt butter in small pan over low heat just so that it is melted. You will notice the white milk solids in the butter. We don't want these. With a small spoon skim off as much of the floating milk solids as you can. Carefully pour the clear butter into a glass measuring cup leaving behind the remaining solids. Using a basting brush butter the insides of a small glass baking dish (large enough to just hold the potatoes and, preferably, with deep sides) with a little of the butter. Slice the potatoes into paper thin slices, using a mandolin, box slicer, food processor, whatever you have. Line the bottom of the baking dish with white potato, brush very lightly with butter. Add a layer of sweet potato, brush with butter. Repeat layers until you have used all of the potatoes. If you use salt & pepper put a little on the middle and top layers. In a perfect world your potatoes should reach or almost reach the top of the dish. Cover with foil and bake in 400F (200C) oven for 45 minutes. Uncover and continue baking an additional 15 minutes or until brown on top and knife goes into center easily. Remove and let rest for 5 - 10 minutes. Invert on to a large plate - it should retain it's shape.